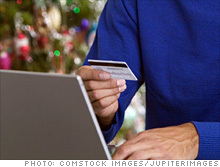 More than half of all Americans will use their credit cards this holiday for online or in-store purchases. Here's how to use credit wisely. How much are you spending this holiday compared to last year? NEW YORK (CNNMoney.com) -- You are at the checkout counter with an armload of packages and as you dig into your purse or wallet, you're presented with an offer of a store credit card along with a holiday gift. The temptation to sign up for the retailer's promotional credit card offering a discount on all the stuff you're handing over to the cashier is high, but what you may not know is not all cards are equal. The better deal may be using the card you already have. Here are some tips on how to how to get the most out of buying by credit card. Beware of an in-store promotional card that offers an initial store discount and even a discounted introductory rate. Those 10%,15% or even higher discounts come with high interest rates, low credit limits and you can only use it at that store. "In-store credit cards are structured like subprime credit cards. Even if you start with a low rate, these rates generally go into the low 20s," said John Ulzheimer, president of consumer education at Credit.com. "Terms retailers offer, a 24.9% interest rate and a credit limit of $1,000, are terms reserved for high-risk borrowers," he adds. Also, when you apply for a new card, an inquiry is made to the credit bureau, which may slightly lower your credit score. Check which of your cards has the current lowest rate. Some card rates have gone up more than 20% this year. Check your most recent credit bill or call customer service for your current APR. Make sure you have a careful look at the fine print now to see how high those rates can go. In most cases it makes financial sense to use the card with the lowest rate for your holiday shopping but only if you won't exceed that card's credit limit. Credit card companies are slashing credit lines across the board or even closing accounts without prior notification. Your credit card limit may have been already lowered. Check your most recent billing statement for your current limit. If you try and spend more than this limit, you will run into over-credit fees and penalty rates and may hurt your credit score. "Your credit score depends on how much of your credit you are using. So if you had a credit card balance of $5,000 and your limit of $20,000 was lowered to $10,000, your credit utilization rate would suddenly surge to 50%," said Samir Kothari, co-founder and vice president products at Billshrink.com. "Those with the highest credit scores have a credit utilization rate of 7%. If you want to hit the sweet spot, don't go above 10% on either one card or across all accounts," said John Ulzheimer. Credit cards like American Express and certain Visa cards offer "return protection," which means your issuer will take back items -- in new condition -- that the retailer will no longer accept, up until 90 days after the original purchase. You will need the original receipt, and the name and location of the merchant. There is usually a dollar limit, about $300, for each item. Check with your credit card company. This is good option for early shoppers who may want to make returns after a store's standard 14-30 day return policy expires. Some bank affinity or elite credit cards actually have price protection policies for 60 days, so if your favorite store slashed prices after the holidays, you could be eligible for a refund of the difference in cost. If, for example, you buy something with Citi PremierPass Card - Elite Level, and then see it advertised for less in print within 60 days of your original purchase, you may be able to receive a refund for the difference up to $250. This excludes Internet purchases and certain items and only applies to merchants who are authorized dealers of the item you purchased. Keep your original receipt and a copy of the print ad. You'll save yourself money and a major headache if you know what you are spending and how you are going to pay for it. Make sure you've got enough cash in the bank to cover your credit card spending, your regular monthly expenses and other upcoming expenses, like a tuition bill due in January. This will give you a good sense of whether or not you have enough to pay your bill on time, avoid late fees and a bump up in interest rates. Credit card purchases almost always cost more than cash purchases. You rack up finance charges and fees paying with a card, and even if you pay your balance on time, often end up spending more than you intended to. "Saving money in advance, creating a budget and using cash instead of credit is the recipe for success when it comes to holiday spending because it helps you avoid debt," said Joseph Montanaro, a certified financial planner with USAA. Talkback: Are you planning to use your credit cards less this year, and pay for more holiday purchases with cash?